Supercharge Your Homeschool – Creative Learning Techniques that Make a World of Difference! Let’s face it, homeschooling isn’t easy, but it certainly can be fun. Whether you are new to homeschool or an old pro, the truth of the matter is, we all get into ruts. The exciting news is that with a few simple tips and ideas, you can supercharge your homeschool any time at all. 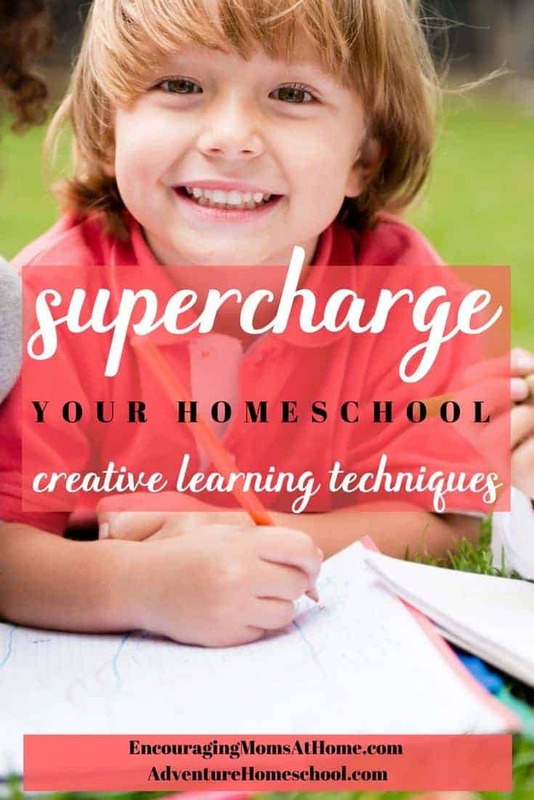 Supercharge your homeschool with easy ideas and tools you most likely have available at home! Creative teaching methods don’t need to be difficult in order to be effective. Change location! Take your homeschool outside to the yard, the park, or even a different room in the house. Often, changing location can completely reset the atmosphere on a bad day. Speaking of bad day . . . don’t be afraid to call a “do-over.” If the day isn’t going well, send everyone back to their rooms for a little quiet time. Have your tea, read your Bible, and turn on some praise music. Then, call them back out and pretend it’s the start of a new day! They may giggle at your silliness, but the change will be a welcome relief for you all. Begin with Jesus! The day always goes smoother when we start with God’s Word. It’s a good reminder for both mom and kiddos to keep hearts and minds on the Lord. Pray together, and ask for His blessing on your day. Tell God that you desire to honor Him with your day. Read out loud together using living books – textbooks can offer value as well, but children soak up a good amount from a book and don’t even realize they are having school! ASK kids what they WANT to learn about. Crazy, I know. But, when you show your children that you care about what they want to learn, maybe even write it down, they are more willing to listen as you explain what you need to cover. Partner together as you plan the week. Give them ownership. If you are asking them what they want to learn, and involving them in the planning, you’re already a step ahead. Offer them a checklist, planner, or simple calendar they can decorate and track their work. Let them take the wheel as much as possible in owning the responsibility and they’ll learn to take pride in their work. Start young with chore charts and star stickers! Step away from the desk. Real learning often takes place in the kitchen, yard, park, field trips, or walking around the neighborhood. Talk about the books you’re reading, watch and discuss educational videos, cook recipes from the places you’re studying. Do art in the yard (it’s less messy). Do math in the driveway with chalk. Write on sliding glass doors or windows with dry erase markers. Incorporate simple tools into your lessons. Taking a walk? Have kids throw on a backpack with a nature journal, colored pencils, binoculars, measuring tape (for trees, leaves, measuring between paw prints – whatever), magnifying glass, and a field guide. Suddenly, they are REAL explorers and scientists collecting data! Ask open ended questions. The great news is, you don’t have to know the answers! Seriously. Let them expound on those opinions, thoughts, and hypotheses. Jot down observations, sketch pictures, write down questions and thoughts, and you can research together later to learn more. Use fun themed notebooking pages to inspire creative learning. Allow students to draw, write at their own level, and even dictate a few sentences as needed. Write rhyming words, observations, descriptions, and facts on the pages. The more often you have them practice this technique, the better they will get. Don’t worry about correcting them initially. That can come later, if needed. They can also copy passages from quality pieces of literature and poetry. Use or create Unit Studies based on topics your students love in order to inspire a love of learning. Choose any topic, gather a few resources (books from the library or at home, google it, search Pinterest for fun activities and before you know it, you’ll have a ton of ideas. Need to incorporate grammar? Have kids give you descriptive words (adjectives) or let them circle the nouns and draw a line under the verbs. Creative writing? Let them write a short story or paragraph on the topic. Do book reports, design power-point presentations, and create dioramas on the topic of choice. You’ll be a unit study pro in no time!